Home-made gravlax is easy to make and never fails to impress. Trim the salmon and cut away any pale bands of fat at the edges, then run your fingers over the flesh and use tweezers to remove any small bones that you find. In a shallow dish, place the fillet on a large sheet of clingfilm and pour the vodka over. Mix the sugar, sea salt and lime zest in a small bowl, add a little black pepper to taste, then spread the mixture over both sides of the salmon flesh. Wrap the fillet in the clingfilm, then place a small board on top of the fish and some weights on top of that. It will release lots of liquid. Chill for at least 24 hours, and up to 48 hours, turning the fish halfway through. The following day, unwrap the salmon, discarding the clingfilm and any liquid. Starting at the tail end, hold a sharp knife at an angle so that it is almost flat on the fish and cut paper-thin slices away from you. Arrange the slices on a clingfilm-lined plate, cover with more clingfilm and repeat until all the salmon is sliced and wrapped. Chill until needed. Discard the skin. Shortly before serving, peel the papaya, cut in half and scrape out its seeds and any fibres with a teaspoon. Cut the papaya into pretty slices and place in a large mixing bowl with the salad leaves. Whisk the lime juice with the olive oil in a small bowl and season to taste. When ready to serve, pour the dressing over the papaya salad and gently mix. 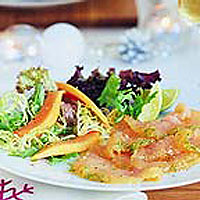 Arrange 4 or 5 slices of the gravlax on each of 6 small plates, then add some of the salad. Garnish with lime wedges, if you like. Serve immediately. If using waxed fruit, scrub them thoroughly before removing their zest. Use any leftover juice from the zested limes to make our lime syrup recipe.